This volume re-examines the evidence surrounding the rise and fall of peacekeeping policy during the first Clinton Administration. Specifically, it asks: what happened to cause the Clinton Executive to abandon its previously favoured policy platform of humanitarian multilateralism? 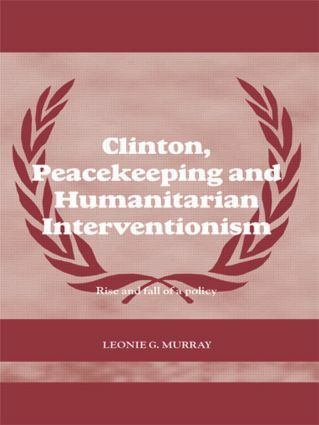 Clinton, Peacekeeping and Humanitarian Interventionism aims to satisfy a large gap in our understanding of events surrounding 1990s peacekeeping policy, humanitarian intervention and the Rwandan genocide, as well as shedding some light on US policy on Africa, and the issues surrounding the current peacekeeping debate. Leonie Murray takes an unorthodox stance with regard to the role of public opinion on peacekeeping policy, and delves deeper into the roles that the legislature, the military, and in particular, the executive had to play in the development of US peacekeeping policy in the 1990s. The conclusions reached concerning the role of the United States and the International Community in the face of the Rwandan Genocide are of particular note in their departure from the accepted wisdom on the subject. This book will be of interest to students of peacekeeping, international relations, US foreign policy and humanitarian intervention.